This is a continuation in my weekly series Things I Like. Last week I featured Beyond Good Intentions. You can follow the series by going here. Comments are always encouraged; especially suggestions. 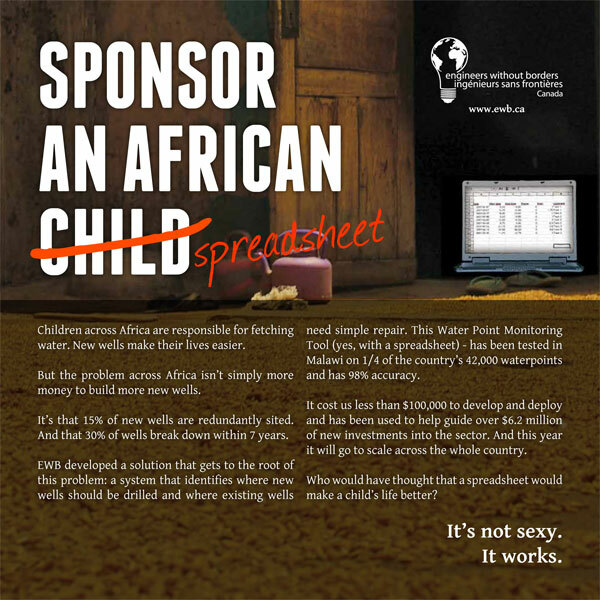 So they got me with the nerdy campaign above, but Engineers Without Borders (EWB) is not just about being a development nerd. They are also responsible for sharing organizational failures and creating a space where others can share information and admit failure. Any organization which is brave enough to say that it is nor perfect scores some bonus points for me. EWB leans on the skill set of its members to find and implement innovative solutions in development. It is encouraging to see people who can bring new skills to the table so that others may benefit and learn. This creates a shift in focus which is now evident in their admission of failure and the above graphic which forces the viewer to think about the continuity of projects after the cameras have flashed and celebrations take place. In terms of skills, it allows for them to be shared in a way that can lead to project sustainability. In order for wells to be successful, there has to be training to enable people within the community to maintain the well. This understanding builds the foundation for individuals to develop and maintain projects within their community. By passing along skills, EWB makes itself less needed. Note: As Stephen comments below, I am specifically talking about EWB-Canada. The website notes,"Most of these organisations started between 2001-2003, following EWB-Canada's inception. Each is legally independent and there is no formal affiliation among them." There are some informal connections between each of them, but there are differences in things like mission and structure. I have a positive view of the other EWB organizations, but the Canadian one is what I am talking about in this post.